Emy Augustus: Mani hands: Pink with Silver Border, Instagram Edition! Mani hands: Pink with Silver Border, Instagram Edition! Good morning! I thought I would share some of what I have been up to through pictures selected from my Instagram feed. I tried a few simple variations on the standard manicure - First is what I like to think of as the borderline style. I saw it online and thought for a good while about how to achieve it on my own. I first painted a thin layer using a Sally Hansen silver (Celeb city). I find metallic nail polishes easiest to control. For me, the creamy, milky pastel polishes are the most challenging to work with! Metallics glide on smoothly and are very forgiving. I tried to bring the silver color as close to the cuticle as possible. 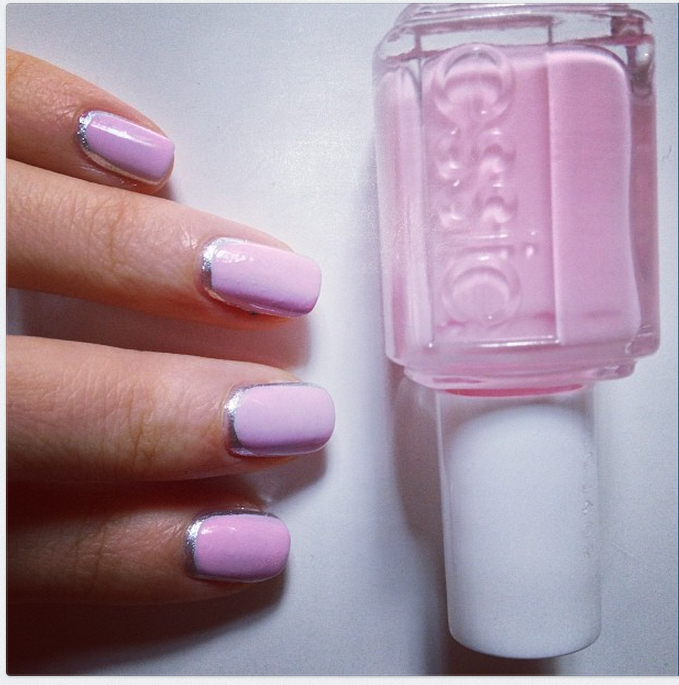 Next came the Essie pink (Muchi muchi). As expected, it was easier than if I had painted the whole nail as there is less surface area to cover. Working with my non-dominant hand was a bit trickier and the silver border came out thicker on the right hand. However, overall, they looked great! I can't wait to try this with other colors. I'm hoping to get a gold and shimmery white polish sometime in the near future. The trick to designs like this is to keep the hand muscles loose and relaxed while knowing exactly where you want the brush to go. So, having a plan and being precise - but not getting tense. Also, as with all diy manicures, cuticle prep is crucial! Feel free to add me on Instagram - emyaugustus is my user name. Those of you who follow me know these pictures are from a while ago. I never have time to blog when school is in session, so re-capping from Instagram might be the only way!